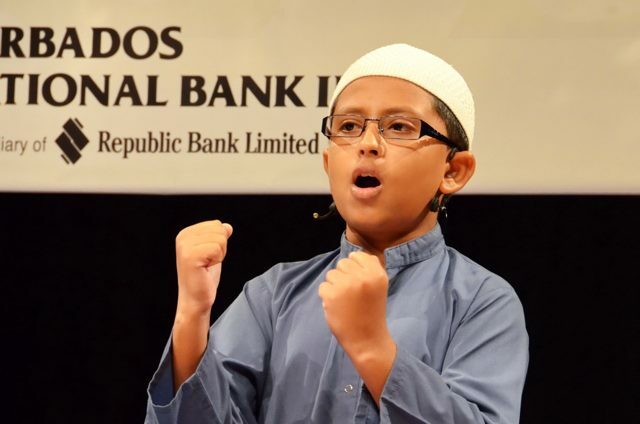 Al Falah Muslim Primary school student, Sulaimaan Ukadia, won again this year in the Barbados National Bank (BNB) Right Start Primary Schools Speech Competition.11 year old Sulaimaan successfully defended his first place title from last year against a field of forty-six students from 26 primary schools island-wide. 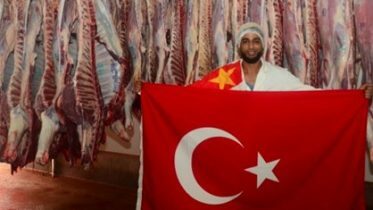 The Al Falah School saw two of its students make it pass the first round of competition into the semi-finals which had 12 contestants vying for the six places in the finals. The Speech competition now in its second year brings together Primary school students age 9 to 11 in a contest of presenting a speech on a given topic for 5 minutes. According to BNB’s assistant manager in the marketing and corporate communications department, Solange Bruce, the competition aims at helping children develop their language skills and speech delivery as well as building their confidence.It was noted that the standard of the competition was much higher this year and one of the judges pointed out that the children made excellent use of language and gestures, as they demonstrated good evidence of preparation and research. In the finals, Sulaimaan’s topic was “Savings, the Right Start”His presentation on the topic was delivered with full confidence and well received by the audience. He made use of humor, current affairs, quotes and urging those present to save not only money but the environment so that future generations would benefit.An excited Sulaimaan thanked his parents and teachers for their assistance that led to his winning for a second straight year.His last year’s winning speech was on “Cricket”. Be the first to comment on "Barbadian Student successfully defends speech competition crown"